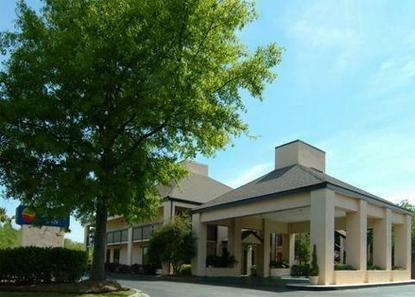 Conveniently located just 10 miles from historic downtown Charleston, the Comfort Inn Coliseum is less than two miles from the Charleston Air Force Base / International Airport and the North Charleston Coliseum, Performing Arts Center and Convention Center. This Charleston hotel is minutes from Charleston Southern Univ, the College of Charleston, MUSC, and The Citadel. Each guest room is well-appointed with refrigerator and microwave, hair dryer, in-room safe, iron/board, and wireless high speed internet access. Start your morning off right with our Comfort Sunshine breakfast featuring fresh, hot Belgian waffles and biscuits smothered in sausage gravy. Enjoy the refreshing outdoor swimming pool with spacious sunning deck.